Dazzle 'em with this totally seasonal sensation—the chocolate cake goes from the countertop straight to the oven in one bowl. 1. HEAT oven to 350ºF. Prepare cake batter, in 2 1?2-qt. ovenproof bowl, as directed on package; scrape side of bowl. Beat cream cheese, egg and granulated sugar until well blended; spoon into center of batter in bowl. 2. BAKE 1 hour 5 min. or until toothpick inserted in center comes out clean. Cool in bowl 10 min. Loosen cake from bowl with knife; using potholders if necessary, invert onto wire rack. Remove bowl. Cool cake completely. 3. MEANWHILE, beat dry pudding mix, powdered sugar and milk in medium bowl with whisk 2 min. Stir in Cool Whip. Refrigerate until ready to use. 4. PLACE cake on plate; frost with pudding mixture. 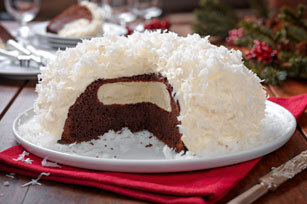 Cover with coconut. Keep refrigerated.